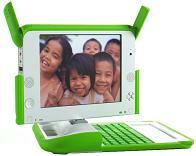 Last night I had the chance to see the One Laptop Per Child (OLPC) laptop in person for the first time. Everybody has their opinions about the project; but putting aside the political discussion, OLPC laptop (aka the XO) is undeniably cool from a technology standpoint. The hardware design is impressive — and I can confirm that it looks just as good in real life as in the publicity photos — but to me, the most interesting part is the user interface. From the ground up, the OLPC interface is like no computer you’ve ever used before. The OLPC user interface is called Sugar. I won’t give a comprehensive description; for the full run-down, see the Getting Started guide, or the Sugar page in the OLPC wiki. Instead, I’ll just cover my two favourite parts: the focus on activities rather than applications, and the journal, which replaces the hierarchical file system. Coincidentally, these two ideas both relate to points on my wishlist of 5 ways to radically change computers (for the better). As you may remember, in the traditional desktop metaphor, we do most of our work in applications, which are specialized programs that manipulate files. First you start an application, then you use that application to do things to files: create, open, modify, and save. If you’ve never used a computer, these concepts might seem a bit weird. What exactly is an application? What’s the difference between opening a file and opening an application? And why do you have to save? Based on the Object model associated with files, each kept Object is, technically speaking, a separate instance of the activity which created it. This eliminates the need to “open” a file from within an activity, replacing the act of opening with the act of resuming a previous activity instance. Of course, a child will have the option to resume a drawing with a different set of brushes, or resume an essay with a different pen, providing “open with” style functionality, but no substitute for an “open” command will exist within an activity’s interface. We believe that the traditional “open” and “save” model commonly used for files today will fade away, and with it the familiar floppy disk icon. The laptops do not have floppy drives, and the children who use them will probably never see one of these obsolete devices. Instead, a more general notion of what it means to “keep” things will prevail. Generally speaking, we keep things which offer value, allowing the rest to disappear over time. Most of us heard the “save early, save often” mantra, largely ignored it, and incurred the consequences. The laptops aim to eliminate this concern by making automatic backups. This lets the children focus on the activity itself. Unfortunately, activities still need to be managed just like applications — you have to explicitly stop them in order to free up resources. 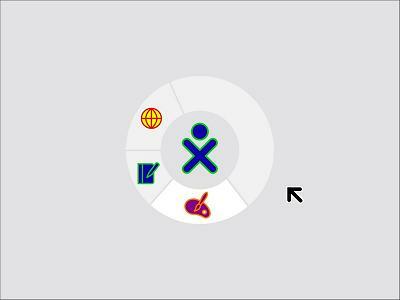 The XO has no swap space, so you can only run a limited number of activities at once. This is communicated to the user through the clever “activity ring” which acts kind of like the Windows task bar, and the amount of space that an activity takes up in the ring corresponds to the amount of RAM it is using. 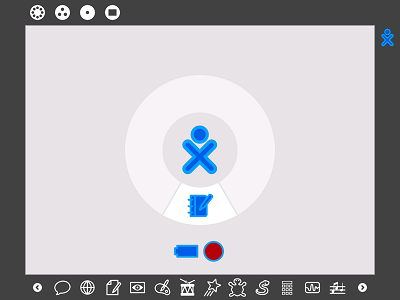 In the activity ring above, you can see that there are Browse, Journal, and Paint activities active. The laptops will drastically minimize the hierarchical filesystem as a means for organization, replacing it with a temporally organized list of activities and events, furthering the Journal metaphor. This drastically simplifies the auto-keeping behavior, since it eliminates the need to specify a location in which a newly started activity should be kept; naturally, the newly started activity will appear as the most recent entry in the journal. Temporal organization functions naturally in the absence of explicit or hierarchical methods, since humankind’s intrinsic relationship to time gives them, at the very least, a relative notion of “how long ago” something happened. By moving back through the Journal, a child can simply locate the period in time within which she knows she made something, and then employ additional use of searching, filtering, and sorting to pinpoint exactly what she’s looking for. Basically, it sounds like they have implemented Lifestreams. It sounds like a great idea, but I’m interested to see how it works out in practice. I would think it’s pretty easy to use, especially for someone who has never used a computer before, but I wonder how well it will scale to lots of activities over a long period of time. I’m really excited about Sugar. It would be interesting to see how it works in day-to-day use — not just for children in developing countries, but for experienced adult users as well. I may actually have the chance to play with one of the XOs for a course project this semester. If I do, you can be sure you’ll hear about it here! If you’re interested in more details on the OLPC laptop, check out Bunnie’s post on disassembling the XO-1, or browse the copious amounts of information in the OLPC wiki. I tried out the Sugar UI back when they released it, but I wasn't impressed. It felt like trading one evil for another--it's different, but I didn't feel like it was better. But you are right, getting rid of save/open and the hierarchical file system are a big step in the right direction. Maybe I should give it another try. Funny you mention hierarchical file systems, since I'm currently bashing them in my related works section of my thesis. You alluded to others posts about the hierarchical file systems on your blog, but I couldn't find any. Am I missing something?